Peacefully, surrounded by her family, on Tuesday January 9th, 2018 at Toronto Western Hospital. Beloved wife of the late Vincenzo of 48 years of marriage. Loving mother of Domenica (the late Giovanni Ilardo), Peter (Donna Mantione), Grace (Nino Sanginesi) and the late Antonietta (Jim Deleo). Proud Nonna of Josie (the late Clem), Jackie (Carlo), Rose (Paul), Jimmy (Anna), Peter Jr., Mike (Caterina), Joe (Linda), Paul (Delanie), Jennifer (Marc), Domenic (Sarine), Rosie, Jimmy Jr. and Adam. 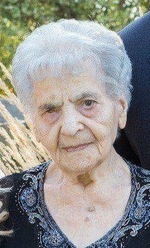 Cherished Bisnonna of 20 great grand children.Gioacchina will also be greatly missed by her many family and friends.